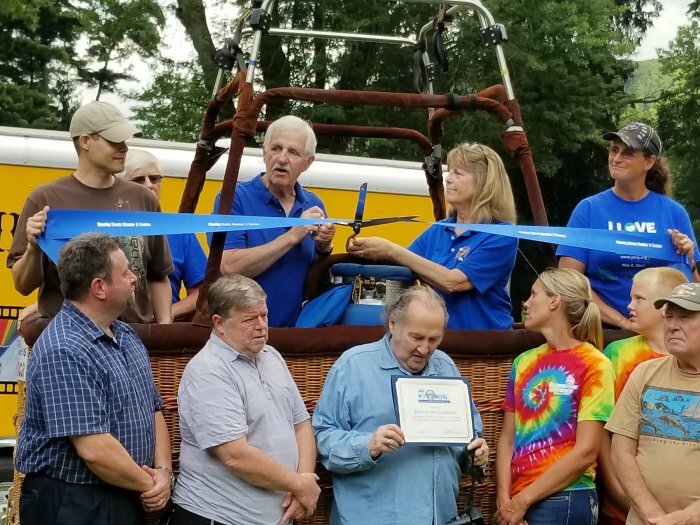 The Wyoming County Chamber and Tourism was pleased to host a ribbon cutting ceremony at the Letchworth State Park launch site for Balloons Over Letchworth on Thursday, July 27, 2017 in celebration of Captain Sean Quigley’s 30th Anniversary as a balloon pilot and owner of Balloons Over Letchworth. A large crowd gathered to congratulate Sean and his wife Denise as they cut the ribbon from the basket of one of his balloons. 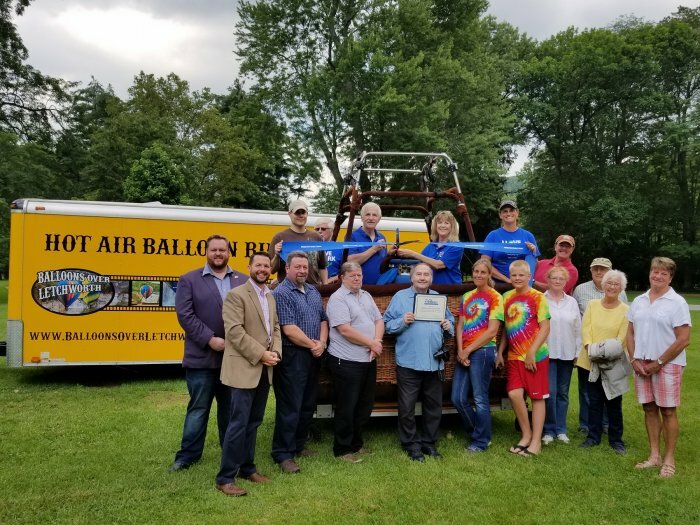 Park officials, friends, and balloon fans all took a moment to congratulate and show appreciation for Sean and Balloons Over Letchworth and the continued successful relationship with Letchworth State Park. Captain Sean Quigley is a F.A.A. licensed commercial pilot; he has since logged over 2000 flights in hot air balloons in festivals and races from Florida to Maine as well as in Europe. In 1989, he placed sixth of 38 countries represented in Le Coup Du Monde, World Cup balloon race in Belfort, France. He has piloted his balloon over the brim of Niagara Falls several times and placed ninth in the U.S. in a distance Long Jump competition, traveling over 114 miles in 2.5 hours. In 2004 he flew in a weeklong festival over the Alps at Chateau d'Oex, Switzerland. In January 2012, Sean flew two flights to 13,000 ft. over the Austrian Alps. The Wyoming County Chamber & Tourism is the leading membership organization for local and regional growth, advocacy, and connection for Wyoming County’s business community. The Chamber & Tourism’s mission is to serve the members and community; promote and grow the area economic and tourism assets; and work collaboratively to create an environment that leads to the success and economic prosperity of Wyoming County. For more information, or to become a member of the Chamber of Commerce, please call 585-786-0307 or visit the website at wycochamber.org.